Alastair Laing, a member of the Art Detective Panel, started a discussion with his assertion that the artist of a painting in the collection of Amgueddfa Cymru – National Museum Wales, titled 'Diana and Acteon (? )', is actually Frans Wouters (1612–1659). He also noted its subjects were not Diana and Acteon, but Venus and Adonis. 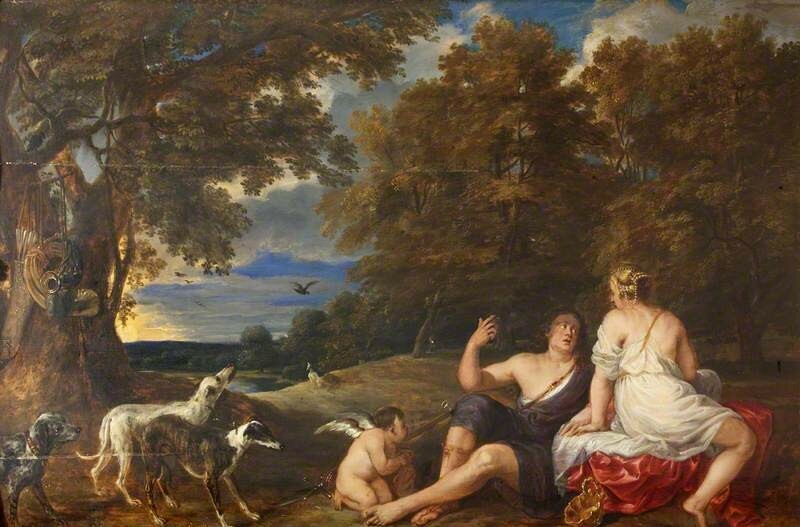 If you search Your Paintings for Venus and Adonis you will see that Cupid is present in many of these scenes, as he is in this painting in question. Alastair suggested that the artist combined elements of works by Rubens and Titian, which depict this classical subject matter. K. Bender added that the painting can be compared to three similar compositions of Venus and Adonis by Frans Wouters. Reviewing these comparisons and the work of Wouters more widely, Amgueddfa Cymru – National Museum Wales were happy to accept the artist attribution to Frans Wouters and the change of subject. They noted they had, meanwhile, carried out their own desktop research and found that the work was part of a small group of Old Master paintings acquired by St Fagans: National History Museum (then the Welsh Folk Museum) in 1953. The work was listed as 'Flemish, 17th century, perhaps by Jordaens and Snyders'. Oliver Fairclough of Amgueddfa Cymru – National Museum Wales remarked that he was looking forward to seeing the painting (which is currently out on long loan), and is grateful to Art Detective and its contributors. Editor’s note: this change will appear on the Your Paintings website by November 2014.